In the past period I have been trying out different ways of getting the computer to assist me in producing scores for guitar an tabs for guitar. Being an Old Schooler I guess I still think that writing it down with a pen and paper works best for me but at the same time do see the advantages of a computerized version to do this. Some om my previous posts with tab examples were made using this very program. So far I have been very impressed with the capabilities of this freeware program. Power Tab Editor is a tablature authoring tool for the Windows operating system. 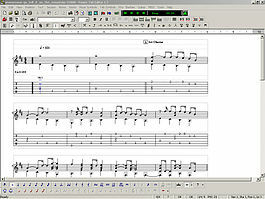 It is intended to be used to create guitar sheet music, more commonly known to musicians as guitar tabs and bass tab. The program provides the most commonly used symbols in tablature, including chord names, chord diagrams, rhythm slashes, bends, slides, hammer-ons/pull-offs, harmonics and palm muting. A useful piece of software for people who want to learn how to play guitar, and for experienced guitarists who want to transcribe their own music and/or guitar lessons. 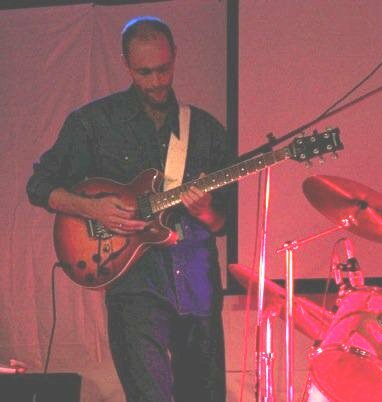 The software can be used by both acoustic and electric guitar players alike. It has the option of writing bass tabs. Especially attractive from my point of view is that it whilst it departs from the tabs as starting point it also shows normal music notation. A definite recommend from my side despite some of its limitations. A very good price/quality ratio. “… kids will take a chance. If they don’t know, they’ll have a go. Am I right? They’re not frightened of being wrong. Now, I don’t mean to say that being wrong is the same thing as being creative. What we do know is, if you’re not prepared to be wrong, you’ll never come up with anything original. If you’re not prepared to be wrong. And by the time they get to be adults, most kids have lost that capacity. They have become frightened of being wrong. And we run our companies like this, by the way. We stigmatize mistakes. And we’re now running national education systems where mistakes are the worst thing you can make. And the result is that we are educating people out of their creative capacities. Picasso once said this. He said that all children are born artists. The problem is to remain an artist as we grow up. I believe this passionately, that we don’t grow into creativity, we grow out of it . Or rather, we get educated out if it. So why is this? I believe our only hope for the future is to adopt a new conception of human ecology, one in which we start to reconstitute our conception of the richness of human capacity. Our education system has mined our minds in the waythat we strip-mine the earth: for a particular commodity. And for the future, it won’t serve us. We have to rethink the fundamental principles on which we’re educating our children. There was a wonderful quote by Jonas Salk, who said, “If all the insects were to disappear from the earth, within 50 years all life on Earth would end. If all human beings disappeared from the earth, within 50 years all forms of life would flourish.” And he’s right. What TED celebrates is the gift of the human imagination. We have to be careful now that we use this gift wisely, and that we avert some of the scenarios scenarios that we’ve talked about. And the only way we’ll do it is by seeing our creative capacities for the richness they are, and seeing our children for the hope that they are. And our task is to educate their whole being, so they can face this future. As a parent concerned about his children, and more importantly the direction education systems throughout the western world are seemingly heading, the TED talk these quotes were taken from really spoke to me. The outcome of the debate and more importantly Brian Nixon’s opinion can be read via Larry King, Jennifer Knapp, Bob Botsford and Ted Haggard on CNN to Discuss Christianity and Homosexuality. The US Army reports that misuse of Powerpoint (in other words, using Powerpoint the way most people use it, the way it was designed to be used) is a huge issue. I first wrote a popular short free ebook about this seven years ago and the problem hasn’t gone away. So much for the power of the idea. Read the rest at via Seth’s Blog: “Powerpoint makes us stupid”–these bullets can kill. Absolutely brilliant and this applies not just to sales presentations but to all of them, whether you are a trainer, priest, professional speaker. In the associated presentation the golden rule seems to be no more than six words per slide. I love it! The truth of the Google duplicate content penalty is quite simply that there is none! If that confuses you, then you have been reading too many misinformed forums or blogs where people get stuck on some popular term that they have no idea what it means, and then profess to be experts. The only experts on the Google duplicate content penalty, and the only people who are qualified to define it, are Google, and in Google’s own words “There is no such thing as a duplicate content penalty”. This comes directly from Google’s Webmaster Central Blog. That should be the end of this article, at precisely 96 words excluding title as I define my word count. But it is not. Why? via SiteProNews: Webmaster News & Resources » Blog Archive » The Google Duplicate Content Penalty: the Truth. In the age of Facebook, Twitter, and texting, many Americans feel more connected to people than ever, but a new national survey by The Barna Group shows that Americans are not just connected to each other. One of the dominant connections in people’s lives is with Jesus Christ. In fact, more people claim to be closely connected to Jesus Christ than have a Facebook page or Twitter account.Close RelationshipThe Barna study, conducted among a random sample of 1,002 U.S. adults, discovered that two out of every three adults 67% claimed to have a “personal relationship” with Jesus that is currently active and that influences their life.While a majority of most demographic segments said they had such an active and personal relationship with Jesus, some segments were more likely than others to claim such a connection. For instance, women 72% were more likely than men 62% to do so. Protestants were more likely than Catholics to cite such a relationship 82% versus 72%. People who describe themselves as mostly conservative on social and political matters were far more likely than those who see themselves as liberal on such issues to connect with Jesus 79% compared to 48%. And one of the most instructive findings was that the younger a person was, the less likely they were to claim to have an active and influential bond with Jesus. Specifically, while 72% of adults 65 or older and 70% of Boomers i.e., ages 46 to 64 had such a relationship in place, 65% of Busters i.e., ages 27 to 45 and only 52% of Mosaics ages 18 to 26 did, as well.Communication in the RelationshipFor any relationship to be meaningful there must be effective two-way communication. Read the rest via The Barna Group – Americans Feel Connected to Jesus. genostv’s posterous – Changing the way you experience television. Forever. via genostv’s posterous – Changing the way you experience television. Forever..